JEZEBEL, Bible Queen: Painted whore? Idol-worshipper? Who was Jezebel? A foreign princess who married Ahab, prince of Israel. She worshipped the rain god Baal, so the Israelite priests of Yahweh hated her. Throughout the centuries, Jezebel’s name was used to describe a promiscuous woman. But there is nothing in Jezebel’s story to suggest that she was ever unfaithful to Ahab. In fact, she seems to have been fiercely loyal to him. Eventually she and all her family were brutally murdered in a palace coup. Jezebel was a Phoenician princess married to Ahab, king of Israel. She lived in dangerous times. There was open war between the followers of Yahweh and Baal. Jezebel’s husband Ahab tried to steer a middle course, urging tolerance between the two groups. 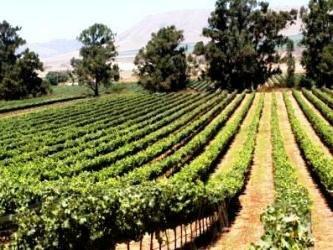 Ahab, Jezebel’s husband, wanted to buy a vineyard near his palace at Jezreel. The owner, Naboth, would not sell. Jezebel arranged the death of Naboth, so that ownership of the vineyard passed to Ahab. Jezebel and all the members of her family were killed during a palace coup d’etat led by a soldier called Jehu. She was cornered in her own palace, thrown down from a balcony and eaten by dogs. Nevertheless she died with courage, dressed royally as a queen and a priestess of Baal. Jezebel was the daughter of the king in the rich coastal city-state of Sidon. Her people, the Phoenicians, were cosmopolitan and sophisticated, and controlled large areas of the eastern Mediterranean. When Jezebel was old enough, a marriage was arranged for her with Ahab, King of Israel (see 10 Bible Warriors: Ahab). What sort of person was Jezebel? As well as being rulers, Jezebel’s parents were high priests in the worship of Baal. 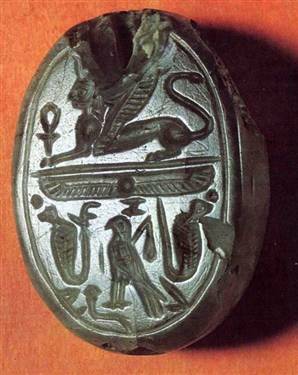 Jezebel herself was probably a priestess of Baal. She was trained to lead and to command. Brought up as a Phoenician, she saw it as her duty to guard the worship of Baal and Asherah. She believed these gods regulated the fertility of the country she now lived in and ruled. ‘As far as ordinary people were concerned, the ancient gods were all around, a daily experience. They were not remote or invisible. They were easy to identify with, since they reflected humanity. See What did the Israelites believe? Many of the people in the northern province of Israel shared her beliefs. They worshipped a number of gods including Yahweh, Baal and Asherah. But others believed they could give your loyalty to only one god, and that this god was Yahweh. The worshippers of Yahweh were the ones who wrote the story and of course they tell the story to emphasize the power of their own god Yahweh. At some time during Ahab’s reign there was a terrible drought throughout Israel and Judah. It is hard for a modern person to appreciate what drought meant to these people, because none of us are likely to die as a result of famine. To ancient people, it was a different matter. As food grew scarce, the old and the very young began to die, then the adults, until only the young, strong adults were left. This was the situation in Jezebel’s kingdom at that time. As the drought worsened, so did the desperation of the people. Every kind of prayer was made to the gods – to any god who would listen. A contest developed between the people who worshipped Baal, and those who worshipped Yahweh. It was a contest that would end with the death of many people. According to the biblical text, the priests of Baal lost the contest in a spectacular way, with fire exploding from the sky. All four hundred and fifty were hunted down and slaughtered by the followers of Elijah. 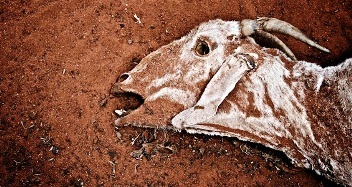 The text then records the end of the severe drought. When Jezebel heard that the priests of Baal had been murdered, she made a vow to avenge their deaths. Elijah knew that Jezebel would make a fearsome enemy, so he fled. During their 20-year reign, Jezebel and Ahab built a new capital city at Samaria. Among other things, it contained an opulent palace and a temple to Baal and Asherah. The palace was a two-storey building surrounding a grand, ceremonial courtyard. 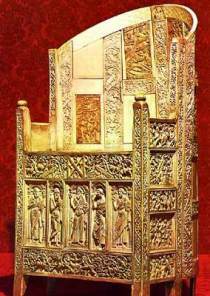 It was called the Ivory House because of the number of carved ivory decorations on its walls and furniture. 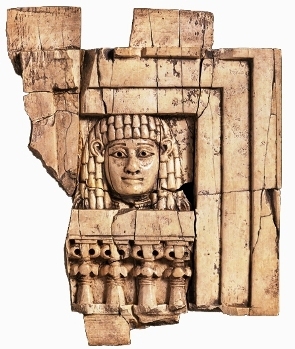 Archaeologists have dug up many of the ivory plaques that decorated the walls and furniture. 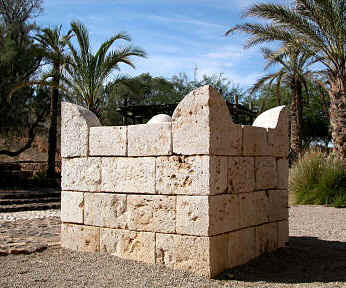 A second royal house was built near Jezreel. It was a villa, overlooking rolling hills and lush vineyards – Jezreel stood in a commanding position looking over the lush Valley of Jezreel. Near the villa at Jezreel was the vineyard of Naboth. Ahab needed to amalgamate this land into the land owned by the royal villa, to grow crops to feed the administrative and military staff living there. He made a fair offer to Naboth, but Naboth did not wish to sell. There was a long-standing tradition that inherited property should not be sold to anyone outside the family, if it had been continuously occupied by the one family since the settlement of Canaan. Naboth held stubbornly to this tradition, defying the king. ‘He (Ahab) lay down on his bed, turned away his face, and would not eat. His wife Jezebel came to him and said “Why are you so depressed that you will not eat?” He said to her “Because I spoke to Naboth the Jezreelite and said to him “Give me your vineyard for money; or else, if you prefer, I will give you another vineyard for it”, but he answered “I will not give you my vineyard”. A still from the movie ‘Cleopatra’. 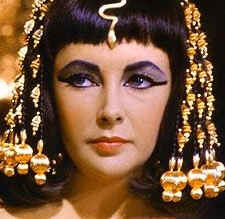 Jezebel believed she had the same absolute power as this Egyptian queen. Ahab was an Israelite, and he understood Naboth’s reasoning. He also understood that the Israelite kings did not have unlimited power, as kings in surrounding countries had. Jezebel, on the other hand, came from Sidon, where her royal parents had unlimited power. She was scornful of the way Ahab let his own subjects get the better of him. The key to Jezebel’s character is that she behaved like a Phoenician princess, not like an Israelite woman. She believed the monarch had absolute power, and was contemptuous of the limitations that the traditional Hebrew Law put on her. Like other Middle Eastern monarchs of the time, she believed that the ruler of a kingdom made the law. Jezebel took matters into her own hands. She had Naboth and his sons accused of treason, on false evidence, and they were duly convicted and executed. The vineyard, being the property of convicted traitors, reverted to state ownership. Ahab had his vineyard. Ahab, husband of Jezebel, spent a good part of his reign fighting on the battlefield – for information about Ahab and his father the legendary Omri, see Bible Top Ten Warriors. Ahab made a military alliance with Jehoshaphat, the king of Judah. Together they warred against the king of Aram, to gain territory that they claimed as their own. In the battle between the two armies, Ahab disguised himself so that the opposing army would not concentrate their attack on him. Depending on your point of view, Ahab acted in either a cunning or a cowardly way. In any event, he was mortally wounded in the battle. 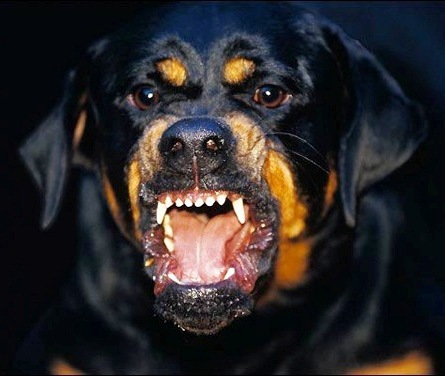 Hunting dogs could bring down a lion. They were trained to work independent of their handlers, so were difficult to control. On the other hand, dogs who were bred to shepherd animals were chosen for their ability to work under direction, so it was easier to teach them restraint. In the aftermath of the battle, the prophecy of Elijah in 1 Kings 21:19 came true. Ahab had fallen and died in his chariot. His blood seeped over the boards of the chariot floor, and when it was taken back to Samaria, some dogs licked at the blood before the chariot could be washed. Ahab was succeeded by his son Ahaziah, whose reign lasted only two years. He was injured in a fall that may or may not have been a bizarre accident, and died soon after. His brother Joram then became king. Both these young men were sons of Jezebel. Who was Jehu, murderer of Jezebel? At this stage, Jehu enters the story. He was an ambitious army officer favored by the prophet Elisha, who anointed Jehu as king even while the reigning king Joram of Israel still lived. (9:1-3, 14). Jehu planned a coup d’etat against the dynasty of Ahab. Gold spiral bracelet of two snakes whose tails are tied in a Hercules knot; from Eretria, on the island of Euboea, 4th–3rd century BC. He saw his chance when King Joram was wounded in a battle against the Arameans. Joram went to the walled villa at Jezreel to recover from his wounds, and there he was visited by King Ahaziah of Judah. Jehu set a trap for both the young kings, luring them out of the safety of the walls of Jezreel, and then he murdered them both. Jezebel, standing on the watchtower at Jezreel, saw it all. The slaughter did not stop there. The success of Jehu’s coup depended on the death of every member of the royal family. 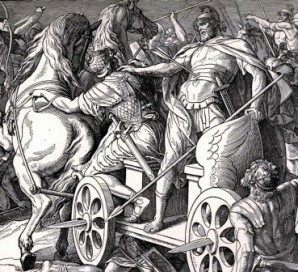 Jehu continued on to Jezreel, and his soldiers broke through the villa’s defences. When Jezebel heard what has happened to her son, she knew immediately what lay in store for her. She did not flinch for a moment. She dressed herself in the full regalia of a queen, with the ornate ritual make-up and head-dress of a priestess of Baal and Asherah. Painting one’s face was more than a fashion statement for a queen/priestess like Jezebel. Ritual make-up denoted separation from the ordinary, and elevation to a higher state of being. For a queen, it was a badge of office, showing her rank and her separation from the common people. Jezebel went out onto the balcony of the courtyard to face Jehu as he approached. She called him ‘Zimri’, the name of a murderer and usurper of a previous king. She accused him of murdering his anointed king. ‘When Jehu came to Jezreel, Jezebel heard of it. She painted her eyes, and adorned her head, and looked out of the window. 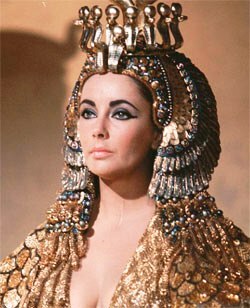 JEZEBEL: This image from the film ‘Cleopatra’ shows Elizabeth Taylor in the headdress and make-up of an Eastern queen. 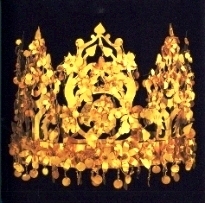 Jezebel’s regalia would have been similar, but more modest. As Jehu entered the gate, she said “Is it peace, Zimri, murderer of your master?” He looked up to the window and said “Who is on my side? Who?” Two or three eunuchs looked out at him. He said “Throw her down.” So they threw her down. Some of her blood spattered on the wall and on the horses, which trampled on her. Then Jehu went in and ate and drank. 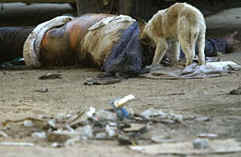 A stray dog eating a corpse in Iraq. Then he murdered every one of the male children of her family, about seventy in all, ordering that their severed heads be sent to him in baskets (2 Kings 10). Jezebel means ‘Where is the prince?’- the fertility god Baal, favourite deity of Phoenicia, Jezebel’s original homeland. Baal was in the Land of the Dead in winter. So his followers would chant ‘Where is the prince?’ to encourage the return of Spring. Jezebel was unflinchingly loyal to Baal, and went to her death wearing the ritual make-up and headdress of a priestess of Baal. Ahab, Jezebel’s husband. ‘Ahab’ means ‘brother of the father’. Ahab’s father was a famous warrior, and Ahab lived in his shadow. Elijah the prophet. His name means ‘My god is Yah’. There was no room for negotiation in Elijah’s nature. He worshipped Yahweh with his whole being. Jehu, the opportunist usurper who murdered Jezebel. Jehu means ‘It is he, Jah’. political conflict about the nature of kingship. Jezebel came from Phoenicia, where her father was an absolute monarch. She assumed a king had absolute power and could rule as he wished. This was opposed to the Israelite ideal of a king who ruled under the guidance of Yahweh and Yahweh’s priests.